Need some dedicated time and space to get those pesky UFOs completed? 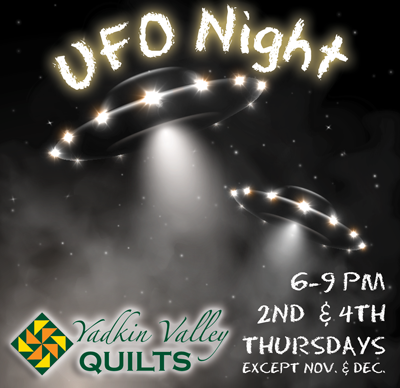 Bring your projects to Yadkin Valley Quilts and join other UFOers as we work to progress through our respective projects to completion, and the much-loved marking off of our UFO lists! Looking for some assistance in figuring out the next steps in your UFO? We gladly provide guidance on projects. If your project requires a great deal of assistance, we would love to schedule a one-on-one session with you.